We are delighted to welcome Tiaho Morgan Edwards on board our good ship! Tiaho is our second cadet who joins us for a 12 month period to learn the ropes and end up at the end of his year with a qualification which will enable him to get a job in the Maritime Industry. Today was his first day on board and we had plenty of passengers, plenty of wind along with some interesting weather! Tiaho was the winner of our Tucker Lewis award for volunteering and we are incredibly grateful to Norm and Donna Lewis who have provided him with a Tucker Thompson scrimshaw for him to wear. Our first Cadet, Ethan King is now a permanent deckhand for the Trust. Ethan is shown with Tiaho and is holding the Tucker Lewis Volunteer Trophy, a trophy that he himself was awarded two years earlier. 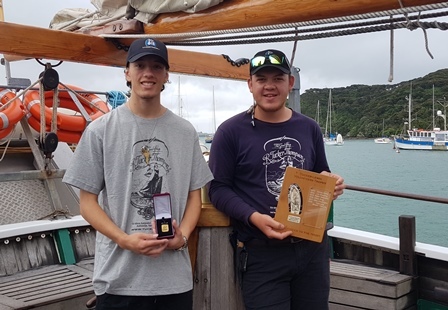 Tiaho studied at Bream Bay College this year and is a former sail trainee, a veteran of three youth development voyages. He has also undertaken a voyage on the Spirit of New Zealand recently and has discovered he has a real love of the sea and sailing. Welcome on board and to the Tucker whanau, Tiaho… nau mai, haere mai!